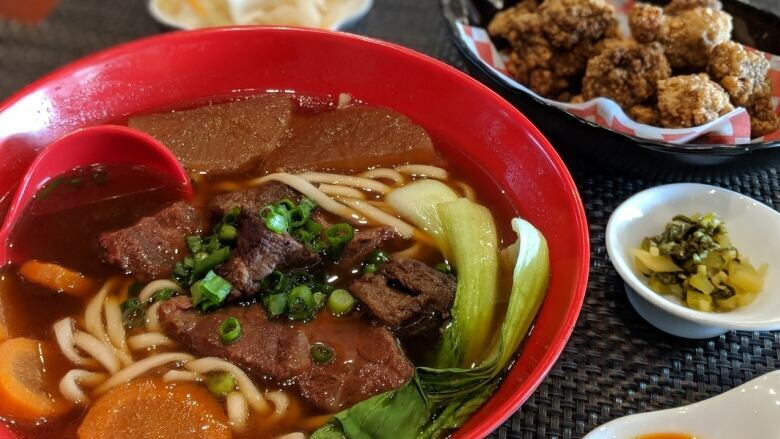 Formosa Bistro, a Taiwanese restaurant that recently opened in Edmonton, is both traditional and delicious. Some 500 years ago, Portuguese explorers landed on the shores of an uncharted island off the southeastern coast of China. The land was long and narrow with forested mountains and sandy beaches that formed at the base of magnificent cliffs. They named it Ilha Formosa — Beautiful Island. The name was officially changed to Taiwan in 1684 but remained in use by many English speakers until the 20th century. Knowing that historical nugget will help you understand Formosa Bistro, a Taiwanese restaurant that recently opened in Edmonton. It should also help to distance it from Famoso, a pizza chain that started in Edmonton in 2005. Formosa is located in a strip mall between car dealerships on 34th Avenue, between a Persian grocery store called King of Dates and a South Indian/Sri Lankan store called Kathir Food Experience. I arrived just after lunch for my first visit and had the entire restaurant to myself. The server recommended the sweet potato fries, a ubiquitous dish offered at night markets and street vendors from Taipei, in Taiwan's north, to Taitung City in the south. She warned me they taste like mini doughnuts. A vegetable that tastes like dessert seemed like a great way to start. The fries arrived steaming hot; the outside crispy coating was perfectly salted and gave way to a slightly sweet interior. My server had not exaggerated. It made me wonder why these aren't served at carnivals and farmers markets. She also recommended the popcorn chicken. I wanted to pass on that recommendation. I had eaten many servings of popcorn chicken in my life. I didn't think this one would be much different. As it happens, that popcorn chicken now ranks as one of my best Edmonton food discoveries of 2018. A dusting of sweet potato flour combined with garlic, ginger, soy sauce, sugar and five spice elevated this dish to a level I never thought possible. I couldn't chew and swallow the tender pieces of sizzling hot chicken fast enough. The beef noodle soup is more complex, as one might imagine the case when beef rib and shank is braised for hours and combined in a robust broth along with hearty chunks of root vegetable, bok choy and chubby, chewy noodles. So, too, were the flavourings in the bao — steamed white buns packed with pork belly (or pork chop or fried chicken), pickled greens, cilantro and crushed peanuts. Typically, I would order at least two bao, but the buns here are large, and one at $7.99 was quite enough. When visiting another country, or sitting at a foreign table, it behooves you to explore that culture's food. It was to owner Yu-chen Lee's amusement that I, sitting alone to eat and obviously not Taiwanese, inquired about and ordered the century egg tofu. "Are you sure?" she asked, "Not many Western people order that." Then, for that reason, yes. Absolutely. Bring me the egg. If you're a patron of Asian grocery stores, you may have noticed cartons containing black eggs — quail, chicken or duck — with labels stating the contents as century eggs, hundred-year eggs, thousand-year eggs, millennium eggs, or simply preserved eggs. The eggs, themselves, are not that old. The preparation method, however, dates back 600 years to the Ming Dynasty in China. The process hasn't changed much over the years. Eggs are still placed in a mixture of clay, ash, salt, and rice hulls for several weeks or months and left to alter into a state of preservation. The process turns the yolks dark green, thickens them to a creamy consistency, and imbues them with a deep, slightly salty flavour. The egg whites turn a translucent amber and feel like stiff jelly. 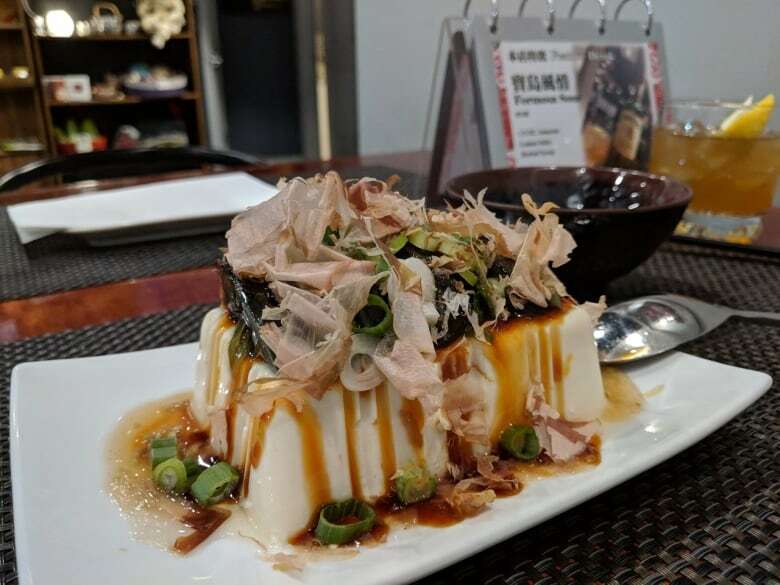 The eggs are then sliced and placed upon a block of silken tofu, topped with bonito flakes (smoked, dried skipjack tuna), slivers of green onion, and finished with a drizzle of oyster-based sauce. It's an acquired taste, perhaps, but a surprisingly satisfying one. The creamy tofu and umami-packed egg and bonito flakes acted as a perfect complement to the deep-fried squid tentacles that arrived shortly thereafter. Like the popcorn chicken, the squid is lightly dusted with flour and seasoned with garlic and five spice. But instead of picked carrots and daikon radish, it is accompanied by a Taiwanese version of pickled mustard greens. Variations of pickled vegetable condiments appear with almost every dish. The vinegary aspects help to balance the other components that are typically rich, sweet, or a combination of both. The lu rou fan (braised pork belly over rice) is a good example. If you're looking to try one dish, this might be it. Lu rou fan is Taiwan's signature dish. The saying goes, "Where there's a wisp of smoke from the kitchen chimney, there will be lu rou fan." Chef Yu-lin Shen sticks to a traditional recipe, slow-cooking the pork belly in aromatic soy sauce along with five-spice powder. The mixture is placed on top of perfectly cooked, short-grain rice and topped with pickled cucumber. It is your job to mix it all together and enjoy it to the last morsel. The same can be said for any of the restaurant's dishes. Formosa is located at 9314 34th Ave.